Plaid Lanyards with Cool Blue Plaid, Kilt, Tartan, or Scotland Highlander Themes. Blue plaid lanyards come with pre-printed blue color plaid patterns. Standard hardware attachments for blue plaid lanyards are available in heavy duty nickel color swivel hooks, badge clips, key rings, or cell phone connectors at the same cost. They can be worn as blue plaid neck lanyards or blue plaid wrist lanyards. Blue plaid lanyards also come with a variety of optional hardware attachments, such as safety break-away buckles, heavy duty nickel color, gold, antique brass or black nickel color snap hooks. Any of the pre-printed blue plaid lanyards are in stock, can be ordered at as small quantity as 2 pieces and can be shipped right away. They are good for personal use, Scottish gift shops or stores, resellers, wholesalers, distributors, event fundraising or promotional giveaway gifts. Please check our online catalogs for more blue plaid, tartan, kilt or Scotland Highlander theme lanyards supplies. Plaid pronounced as "Plad". By dictionary plaid is a rectangular woolen scarf of a tartan pattern worn over the left shoulder by Scottish Highlanders. Plaid in Scotland means blanket, usually referring to patterned woolen cloth. In British English, a plaid or a plaid rug is a large thick woolen twill cloth, often tartan, used as a travel rug or as a blanket. In American English, plaid is cloth made with alternating stripes and bands of color woven into or dyed onto the fabric. This makes blocks of color that repeat vertically and horizontally in a pattern of squares and lines. Plaid is also the name of a British electronic music duo, taking their name from the threads of the fabric. A variety of Highlander plaid fabric are used for ties, sashes, ribbons, tablecloth, scarves, trousers, curtains, kilts, rungs, furnishings and garments etc. Specifications: Blue Plaid Lanyards with Cool Blue Plaid, Tartan, Kilt or Scotland Highlander Themes - Blue Plaid Gift Shop Supplies. A Great Lanyard Source For Blue Plaid Gift Shops. 9. Custom Imprinting: On top of pre-printed blue plaid lanyards ( as back ground colors), any customized or personalized logo imprinting available - by way of silk screen imprint. 10. Applications: Used as blue plaid neck lanyards or blue plaid wrist lanyards. 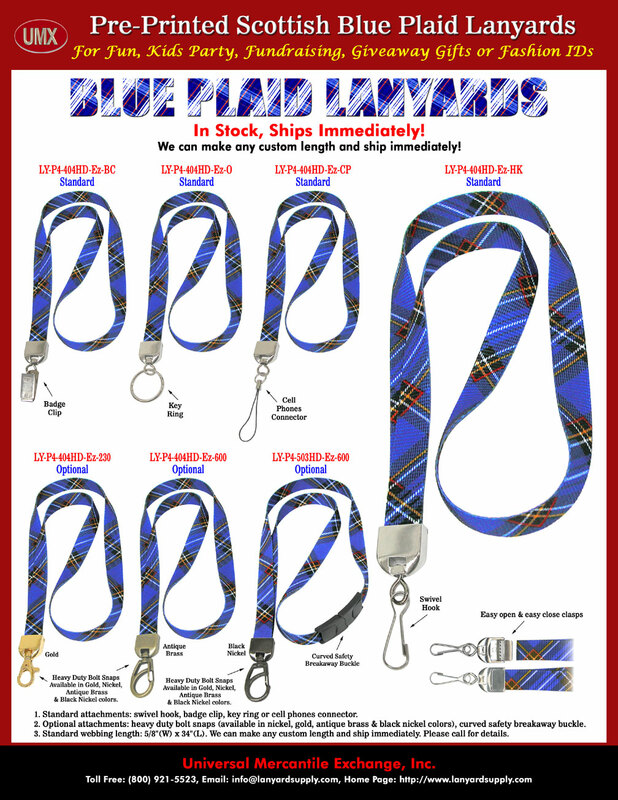 You are viewing > Lanyards > Ez-Adjustable Neck Wear Models > Blue Plaid Lanyard Supply with Printed Color Patterns of Blue Plaids, Tartans, Kilts or Scotland Highlanders.